Whether you are shopping for yourself or as a gift (or both), we've got you covered for wine deals for Black Friday 2018. Save 25% on any Premier Series gift of 4-months or longer. Until Nov 30. No promo code, click for deal. Get a bonus month on any Premier Series Gift of 3 months or more. Until Nov 30. No promo code, click for deal. Free Shipping Give a premium wine club gift of 3 months or longer and get free shipping — Save up to $168. Until Jan 2. No promo code, click for deal. A WineClubReviews.net Exclusive Gift Deal! Bonus Bottle & Free Gift Packaging on any Gold Series gift of 3-months or longer. Bonus bottle is a Napa Valley Cabernet Sauvignon. Total package value is around $30. No promo code, click for deal. These NEVER go on sale... now's your chance! Save $20 on quarterly memberships. Promo code QUART20 until Nov 26. Save $50 on annual memberships. Promo code ANNUAL50 until Nov 26. Save 15% all wine club gifts. Until Nov 25. Promo code BLACK2018. Save $20 on your first purchase. Until Nov 26. Promo code HOLIDAYWINE. Get $99 in Free Gifts with any 12-month wine gift purchase for monthly shipments or 6-month wine gift purchase for shipments every other month. Until Nov 26. No promo code, click to get this deal. Save 35% on any purchase. Until Nov 25. No promo code click for deal. Save 30% on any purchase. Until Nov 24. No promo code click for deal. Not sure about wine clubs as gifts? 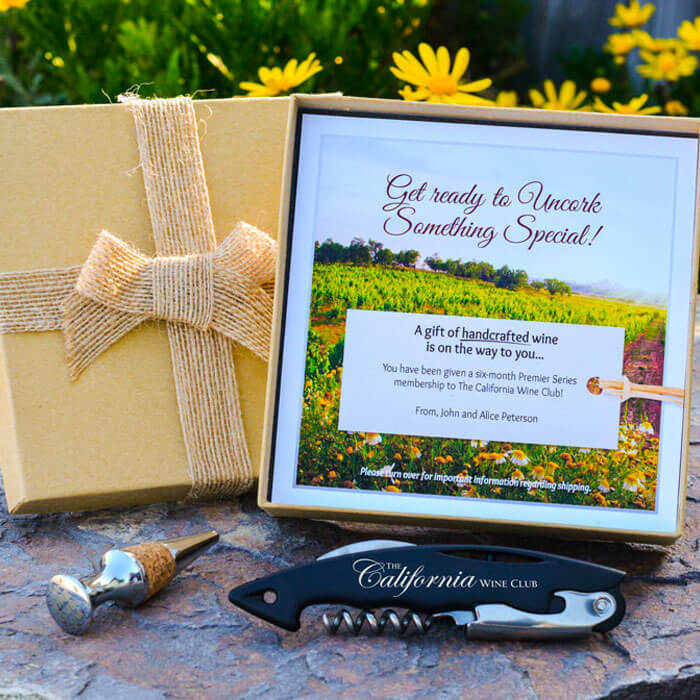 Save 50% on your first shipment of any membership at The California Wine Club (excluding shipping cost of $14). Until Dec 31. Promo Code WCRHALF. Save $45 on your first membership. Until Jan 1. Promo code SANTA. Save $25 on a Nocking Point subscription. Three bottles of wine, a t-shirt, a bag of coffee beans, and if you think about it... a little comic book juju for you, too. Until Dec 1. Promo code NP25. Save $30 on 3-bottle memberships. Normally $49 each month, you'll pay just $9 for your first shipment. Until Nov 26. Promo code THANKSFAM. Save $10 + FREE Shipping + Blanket why you join. Promo code WINEYAY until Nov 26. Not sure about wine clubs? Are Wine Clubs a Good Deal? Save 10% on any order. Wine bottles (singles and sampler sets) in signature Bounty Hunter box and unique wine gift baskets. Only good wine here, no plonk. Until Jan 7. Promo Code HAPPYGIFTING. Save 20% on any order. Wine bottles (singles and sampler sets) in signature Bounty Hunter box and unique wine gift baskets. Only good wine here, no plonk. Until Jan 7. No promo code, click for deal. Free Shipping on 6 bottles or more. Until Nov 26. No promo code, click for deal. Save 20% on all wines site-wide with coupon. Until Nov 25. Promo code BLACKFRIDAY20. Save 30% on their Core & Classics Sampler Pack. Twelve Bottles of Wine, just $99.99. No promo code, click for deal until Dec 31. Save 30% on their Reserve Sampler Pack. Twelve Bottles of Wine, just $149.99. No promo code, click for deal until Dec 31. Save up to $123 on a 6- or 12-pack of rosé. Dennen 2016 Vacationer and 90-point Samuel Robert Winery 2017 Vintner's Reserve Rosé of Pinot Noir. No promo code, click for deal until Dec 31. Want to see more wine? 2018 Cyber Monday Deals on Wine Accessories, Cellars, Decanters, Glassware, Coravin, and more! Special Pricing Varies on a selection of wine accessories. Free shipping on orders over $99. Until Nov 24. No promo code, click for deal. Save 15% on a selection of wine glassware. Until Nov 26. Promo code BF15. Save 50% on the Starry Night Coravin system. Until Nov 26. No promo code, click for deal. Save 20% & Free Shipping on everything else (naturally, some exclusions apply). They'll give you a personalized promo code when you click this link. Until Nov 30.